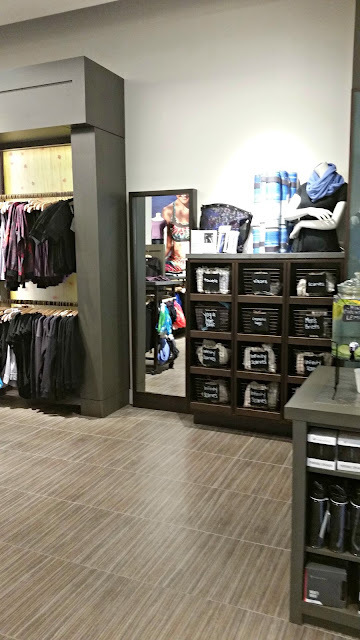 Did You Know Fabletics Has a Physical Store? Well, they do! And I had a chance to check out the one in Columbia, Maryland two weekends ago! I received a seemingly last-minute email from Fabletics inviting me to their store opening for their store in Columbia, Maryland. Wait, store opening? I didn't know they had a store! Unfortunately, I couldn't work it out to get to the grand opening celebration that day; however, I managed to stop by a few days later, which was great because I felt like I had a more normal shopping experience. It was weird being back in the mall where I'd worked part time for 8 years. I probably hadn't been back there since I finally "retired" from Ann Taylor last fall! First and foremost, if you don't know what Fabletics is, check out my original review from last year here. I was actually prepared to break up with Fabletics before I received their email invitation. 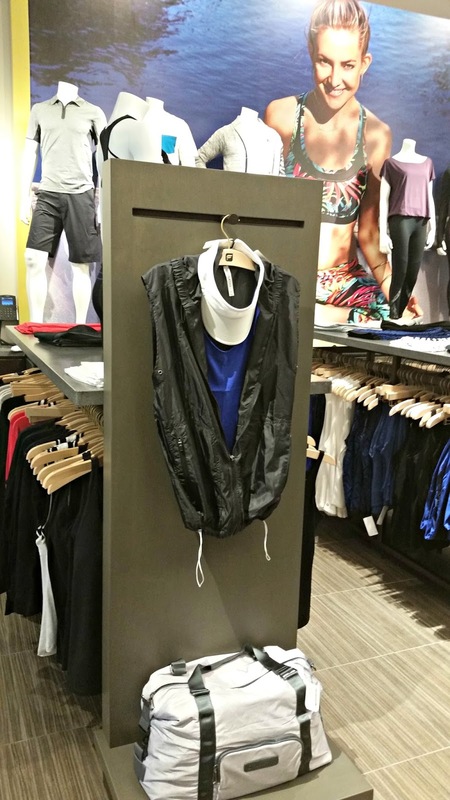 I really cannot get behind this whole "athleisure" trend, and it seems to be the main thing on Fabletics these days. 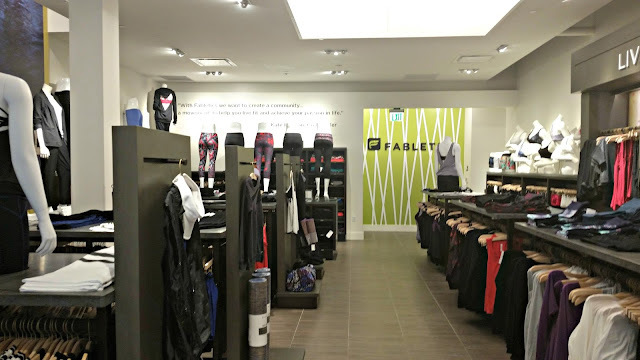 Don't get me wrong: When Fabletics is good, it's really good! I absolutely love their leggings and capris, and I have a vest that I wear for running in the cold that is amazing. However, all of these tops and bottoms with mesh all over, straps crisscrossing every which way across the back, blousy tops that would get stuck in a weight machine... I just can't. Even. I just don't get it! Why would I spend all that money on a top I could buy at Forever 21? 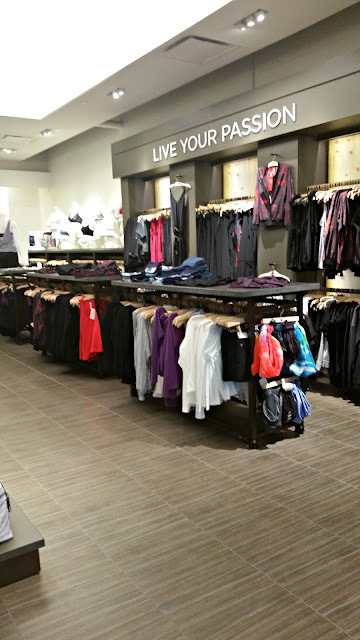 Nevertheless, I decided to give Fabletics another shot, and I'm glad I did. I absolutely love the store! Where do I start? I love that you can actually see the clothing live and in color. Sometimes I'm not sure about the material online, and it's definitely nice to be able to see it right there in front of me. Tops that I thought I'd love in person, I was not too fond of. Some things that I thought looked ridiculous online were actually super cute in person. Another bonus? One-off items. For example, I got this super cute top for yoga/barre/pilates, and it had just been returned by one of the sales associates. Apparently it is no longer available online! Another thing that I loved about being able to go into the store was that I could still earn points and use my store credit. Unfortunately, I couldn't redeem my rewards points, but they told me that was likely because the stores were brand new. What's weird is that I am unable to review the products I purchased in the store. I'm going to check in with customer service on this one. I should be able to get credits for reviewing items I purchased in the store, just like I can online. Humph. I also liked that they had plenty of accessories throughout the store. I saw the bags, headbands, yoga mats, and other items paired with some of the outfits. It was cool to finally see them in real life! One thing to note about being in the store is that the price tags reflect the full price, and not the VIP price. Make sure you ask the the sales associates about the VIP price if you're a VIP member! 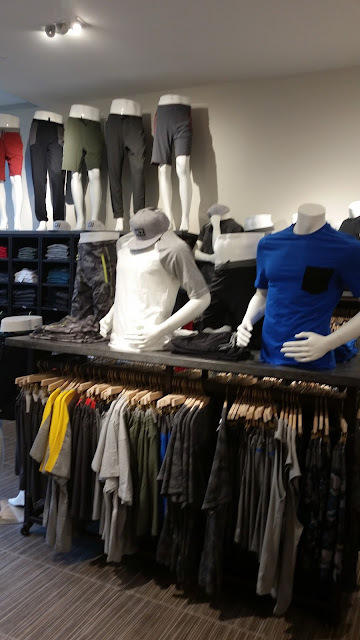 Fabletics store fun fact: The men's Fabletics line, FL2, is available in the stores. In fact, it's prominently featured as soon as you enter the store! I really loved the decor in the fitting room. There was a lovely carpet, and the lighting in the room was great. 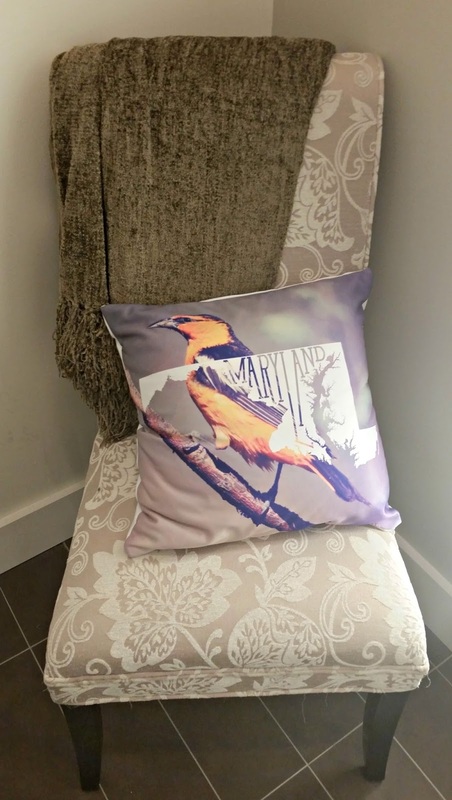 I loved the Maryland-themed pillow, with a picture of the Oriole (our state bird), a map of our state, and the word "Maryland" inscribed in the middle of the map. Super cute, and a nice touch that this Maryland lady just loved! I want to know where to get one of those pillows! All said, I'm really glad that I stopped into the store. As long as they can figure out the rewards situation and the review issue, I will definitely continue being a VIP Fabletics customer! 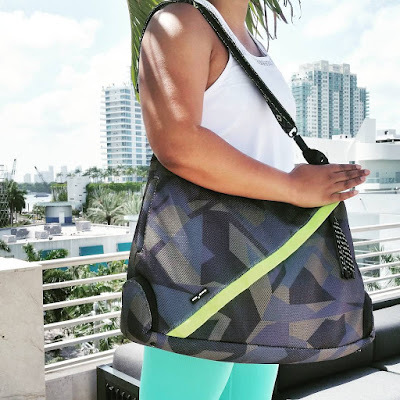 Want to try Fabletics yourself? 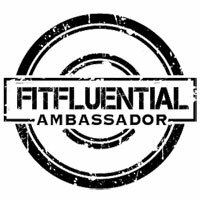 Use my referral code and let me know what you think of the products! Have you ever shopped with Fabletics? 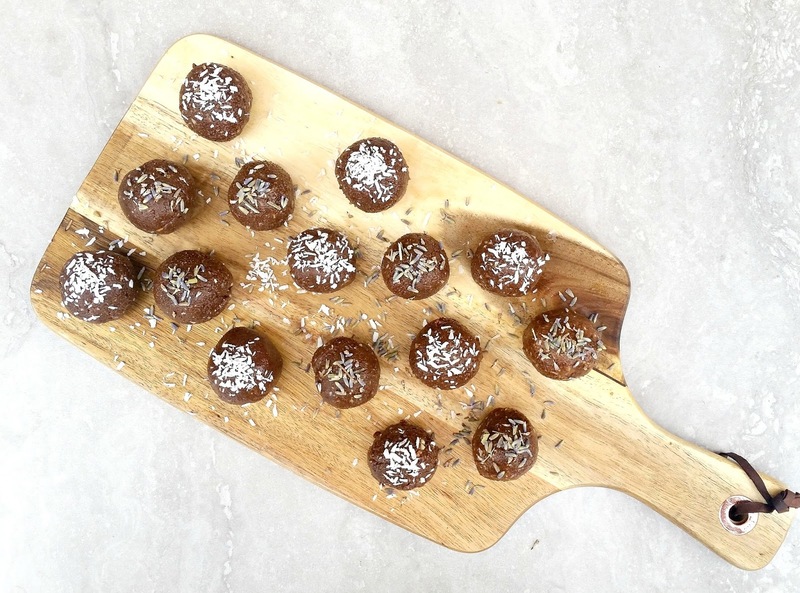 Do you have a store near you? Do you prefer shopping online, or shopping in a brick-and-mortar store? Do you have any questions about the store? I started to do Fabletics recently after someone posting about it on Facebook. I've gotten two outfits and skipped two months and so far so good! I like the clothes but I'm not sure I need a new outfit every month, so I'm going to try skipping a couple more times and getting one at Christmastime, then see! I'd love to visit the store! I especially love their leggings, but I skip just about every month. I like that they send you a reminder so you can skip or buy without being charged! It was so cute! I couldn't find the same exact one on your Etsy site. Can you help a sista out? 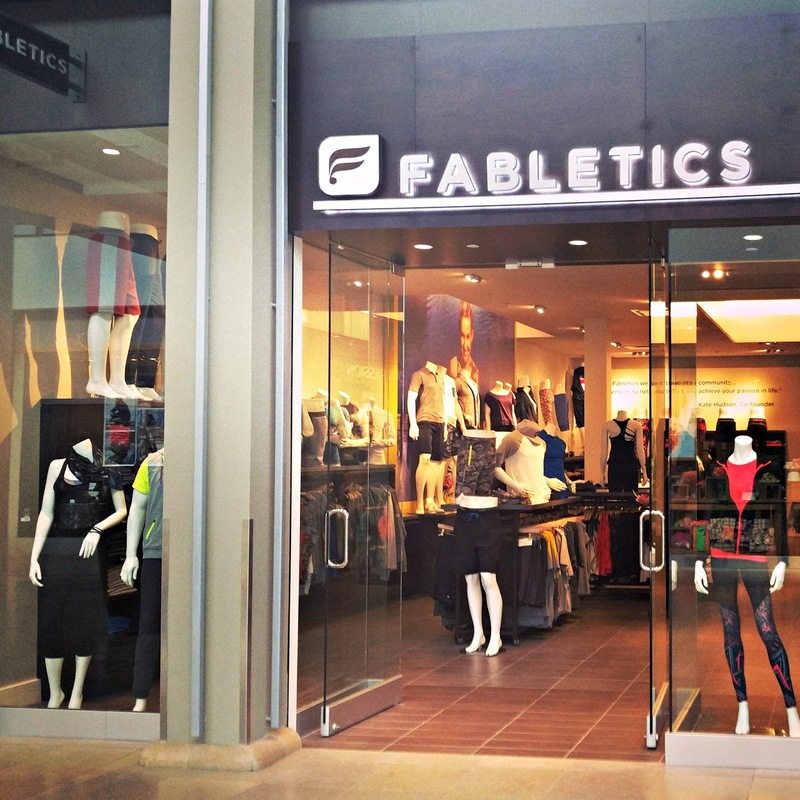 Whoa, I didn't know Fabletics had physical stores either. One of them is even in Ohio! I'm not down by Cincinnati very often, but I'll have to stop in the next time I'm down that way. Check it out! The store in our area is so pretty!